You can open a door from inside the vehicle even if it has been locked. You can only open the rear doors from inside the vehicle if they are not secured by the child-proof locks. If the vehicle was previously locked with the SmartKey or with KEYLESS-GO, opening the vehicle from the inside will activate the antitheft alarm system. Switch off the alarm. - Pull door handle 2. You can centrally lock or unlock the vehicle from the inside. 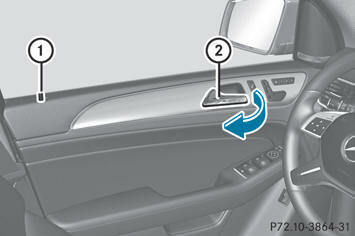 The central locking/unlocking button does not lock or unlock the fuel filler flap. The buttons are located on both front doors. centrally from the inside if the vehicle has been locked with the SmartKey or KEYLESS-GO. vehicle centrally if the front-passenger door is closed. 1 To unlock: press button 1. 1 To lock: press button 2. If all the doors and the tailgate are closed, the vehicle locks. You can open a front door from inside the vehicle even if it has been locked. Only open the door when the traffic situation permits. - and the SmartKey is set to its factory setting, the entire vehicle is unlocked if a front door is opened from the inside - and the SmartKey is set to an individual setting, only the front door that is opened from inside the vehicle is unlocked. If the vehicle has been locked centrally with the SmartKey or with KEYLESS-GO, it is not unlocked when the release button for the central locking is used. The vehicle locks automatically when the ignition is switched on and the wheels of the vehicle are turning at a speed of more than 9 mph (15 km/h). You could therefore be locked out when: - the vehicle is being pushed. - the vehicle is being towed. - the vehicle is being tested on a dynamometer. - To deactivate: press and hold button 1 for about five seconds until a tone sounds. - To activate: press and hold button 2 for about five seconds until a tone sounds. buttons and do not hear a tone, the relevant setting has already been selected. You can also switch the automatic locking function on and off using the on-board computer. If you use the mechanical key to unlock and open the driver's door, the anti-theft alarm system will be triggered. 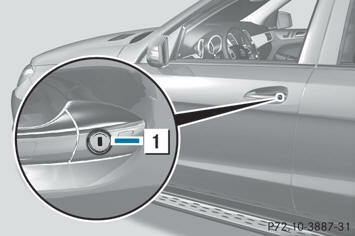 - Insert the mechanical key into the lock of the driver's door as far as it will go. - Turn the mechanical key counterclockwise to position 1. - Turn the mechanical key back and remove it. - Insert the mechanical key into the SmartKey. If the vehicle can no longer be locked with the SmartKey, use the mechanical key. - Open the driver's door. - Close the front-passenger door, the rear doors and the tailgate. - Press the locking button. - Check whether the locking knobs on the front-passenger door and the rear doors are still visible. Press down the locking knobs by hand, if necessary. - Close the driver's door. - Turn the mechanical key clockwise as far as it will go to position 1. - Make sure that the doors and the tailgate are locked. described above, the fuel filler flap is not locked. The antitheft alarm system is not armed.